Sleeps 8 Just steps from the 3 Cabana Club Pools, Camp Fripp for the kids! Enjoy beautiful Fripp Island from 27 Sea Mist Lane. Two houses away from the Cabana Club, far enough for privacy, yet close enough for a short stroll to enjoy the ocean, creek and marsh views from the incredible Cabana - a three pool complex including misty caves, flower edged waterfalls, a bar, cafe, salon and grill-all with incredible ocean views. Perfect for toddlers, with their own giant pool and slide, to adults with 2 additional pools and separate areas. Home is also a very short walk to Camp Fripp & the Activity Center where both adults & kids can sign up for many fun supervised activities throughout your stay! This lovely home has four separate porches with stunning marsh views. Enjoy light and airy living areas which boast wood floors, high ceilings, and beautiful 'island decor' with custom slip-covered chairs and sofa, down throw pillows, sea grass rugs and charming art work. The large dining room comfortably seats 8 at a large English Pine table. Enjoy this fully stocked kitchen with surplus cookware and utensils! Dinnerware and silverware for 8 people. All bedrooms have beautiful all cotton coverlets with different charming bedskirts and shams, and each has their own flat screen TV. The bedrooms are as follows: Main floor queen bedroom with private screened porch, private bath with shower. Upstairs, one guest room has 2 twin beds with private porch, tv and shared connecting bath. One guest room has a double bed with trundled mattress, tv and connecting bath. The master bedroom has a king, walk-in closet, private porch, 2 vanity bath with separate shower and garden tub and also has a tv/dvd in a lovely corner armoire. This home also has a Pack 'n Play onsite for guests with very small children. Main floor porches have wrought iron tables and chairs for relaxing dining or morning coffee, a table with chairs on one porch and a table for on another porch. Upstairs Master deck has a pull-out glider & chair for relaxing. This house comes with TWO amenity cards. Additional amenity cards are available to purchase for access to island pools, golf courses & restaurants. The house comes with Golf Cart for Guest use. Additional carts available for rent. Check in time is 4 pm on arrival date and check out time is 10 am on departure date. No early arrivals or late departures permitted. Maximum of four vehicles, no parking on grass and limited street parking. Questions about parking email. Keywords: 2 Story house 4 bedrooms, 3 bath very open and airy. Close to Cabana Club pool complex and 3.5 miles of sandy beach. This is our South Carolina home. We live in the midwest and come to Fripp Island every chance we get. We choose this house because of its close proximity to the Cabana Club. Our children and grandchildren can walk to their and still come home easily when tired or hungry. Also we are just minutes from the beach and the marina. HOWEVER NOTHING IS VERY FAR AWAY ON FRIPP ISLAND. Also the close proximity to the Activity / Nature center was a huge bonus for us when the children were younger. Close to all of the resorts amenities and still very quite and private. Home is just steps to the Cabana Club pool complex, Camp Fripp, Wardell's Landing and many other Fripp Island Amenities. Bath linens only. WE DO NOT PROVIDE BEACH TOWELS AND PLEASE DO NOT USE THE LINEN TOWELS AS BEACH TOWELS. Parking for four vehnicles There is room for one standard sized vehicles on the driveway. We have provided three space of off street parking at the back of our property. Bath and wash cloth only . NO BEACH TOWELS ARE PROVIDED. At the Community Center of Fripp Island Resorts. minimum, you should bring your favorite items. New major appliances - refrigerator, range, microwave, and dishwasher. The kitchen is a galley kitchen. table will comfortably seat 8.
two decks off of upper level bedrooms; both w/ ceiling fans; one has a pull-out glider. 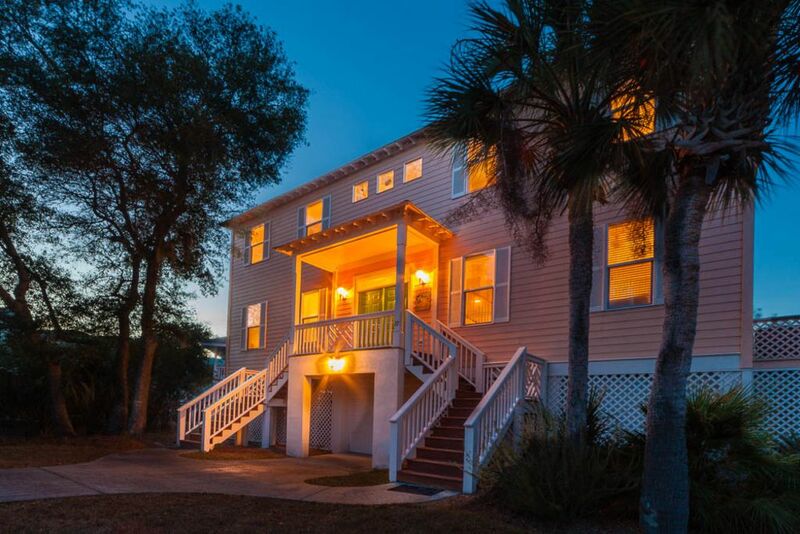 Can be rented from Fripp island Resorts and requires a Fripp Island Resorts Guest Pass. two screened porches off main living level; both w/ ceiling fans. One porch w/ dining table; one w/ gliders & chairs for relaxing. Can be rented from Fripp Island Resorts with a guest pass. Requires a Fripp Island Resorts Guest Pass. At nearby Cabana Club which is a 2 minute walk. Three pools with one pool limited to the children. Pool complex has lunch counter and various other beach amenities. cable TVs, dvds, Stereo/cd player, IPOD dock w/ speakers, coffee pot, Mr. Coffee, toaster, blender, small food processor, outdoor gas grill, ceiling fans throughout & on the porches, linens, towels, start-up paper products, family-type movie collection, paper books, a Golf Cart, beach chairs, beach toys, pool noodles, various balls. We stock the beach items at the start of the season. We cannot be responsible for other renters actions regarding use and abuse. Sorry. We stayed at Express Rest for a week in July. The home's location was great for our family as our kids really enjoy the Cabana Club which was within steps of the property. We liked the layout of the home and how all of the bedrooms were separated. Having a spacious bedroom on the main floor was also nice as my parents came to stay for a few days as well. The porches were a wonderful place to gather in the morning and our teen son enjoyed his "private" porch as he worked on summer AP assignments! The kitchen was well-stocked albeit tiny! Really only one cook could be in there at a time. The spacious dining room was appreciated for family dinners and work space. We had some glitches with the property's golf cart. It had been serviced a few weeks prior, but some wires/bolts were not attached properly. That was our only frustration, but Jim, the owner, was very responsive each time there was an issue. We were given a replacement cart and reimbursed by him for our other cart and the inconvenience. First world problems on an otherwise first-rate stay! We have rented homes at Fripp five different times and this rental is a favorite! Thank you for a fantastic week! Great place for a family to stay! My family had an absolutely wonderful time! This was our daughter's first trip to the beach and she had an absolute blast! We were just a few houses down from the pool, and a short ride from the beach (though you can see it from the property). My kids loved walking down the road to Camp Fripp and seeing/touching the snakes and turtles. The house itself was great - there was plenty of space and was was exactly what we needed. There was room for my family of four, in addition to two sets of grandparents. We will definitely be back next summer and I would strongly recommend this home. Wonderful house in a great location. Both adults and children were comfortable. We have stayed in this house on Fripp Island several times, this was the first time with small children. The close proximity of the Cabana Club was fabulous. The kids really enjoyed the pool. We were a short golf cart ride to the beach. The kids loved collecting shells and swimming in the surf. We made several side trips into nearby towns. Loved having dinner out on the riverfront in Beaufort. Enjoyed shopping in the local stores. We couldn’t go golfing because of a recent knee injury but the golf courses were beautiful. Our children were too young for the Kid’s Club but we went to the Nature Center nearly everyday. It was a wonderful vacation in a wonderful spot. We look forward to our trip next year. Wow! Our first time to Fripp Island and the South Carolina coast. What a wonderful introduction to this part of the country. Our accommodations were clean, well furnished, comfortable, and an outstanding location near the Cabana Club. Our granddaughters had a blast as did their grandparents. We certainly hope to be back! Family friendly, charming island/beach rental. Arrived for our family vacation in October to find a spacious, clean and well-equipped home on this charming island. This four bedroom, three bath rental is within walking distance to the pool/cabana club and nature center. Owners provide many extras like golf carts to get around the island. We enjoyed early morning walks with bird sightings including a bald eagle, egrets, wood storks and blue birds. Since the weather was not really for the beach, we also enjoyed trips into the nearby and quaint city of Beaufort. We also enjoyed cooking delicious meals in a well-stocked kitchen. Plenty of kitchen tools, dishes and spices are on hand. The fridge, oven and microwave as well as the washer/dryer appliances are new. The owners of this rental have put together a family friendly environment with a heart for those who are visiting. I highly recommend this island/beach rental! Lovely house in a fabulous location. Lots of amenities including well stocked kitchen for foodies. Easy walk to beach and cabana house. Lots of recreational activities with some tailored to kids. Nature lovers will find much to see, especially lots of birds. We have been several times and loved it every time. NO PETS permitted NO Smoking. PARKING - for 4 standard sized vehicles - 2 in the driveway and 2 in the designated area at the rear of the lot.